I love the idea of having something special to sport as you celebrate the holidays. Everyone can find a little something special for the season. It seems to be the one time of year that just about anyone can get away with sparkles and sequins. I thought that I'd start out the celebration with a couple of embellished onesies for the littlest ones in our lives. I have sisters and close friends that are going to be delivering some super sweet packages this year, and why not welcome them to the world with some super sweet bodysuits. 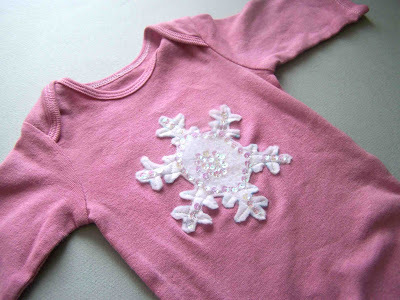 I'll start out with the simpler of the two featured bodysuits The top is made by cutting out a snowflake shaped piece of fabric to be appliqued to the top. 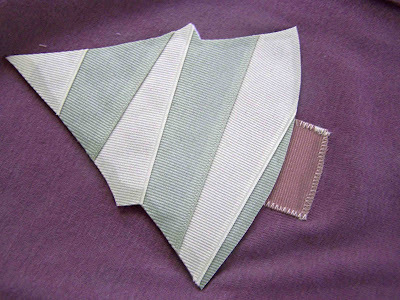 I used white rainbow felt for this project, but any scrap fabric should work. 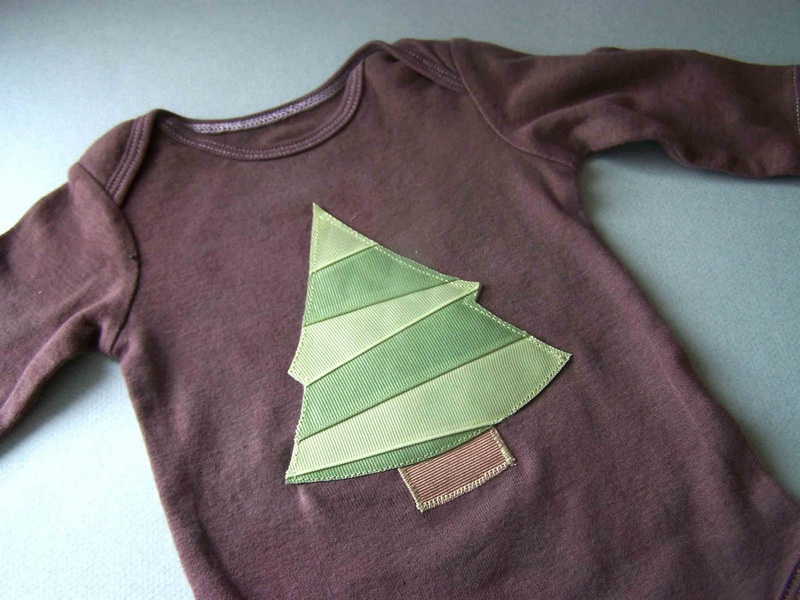 I normally wouldn't applique with felt, but I figure that baby clothes don't typically get much wear, especially when they are seasonal. I found a simple snowflake shape in my publishing program. 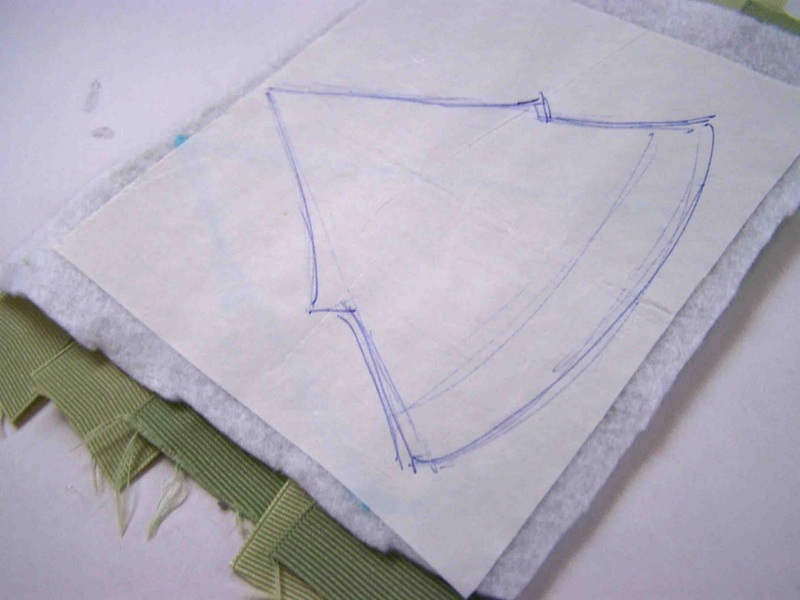 I then sized it to fit the bodysuit, and used it as a template to cut out my fabric shape. 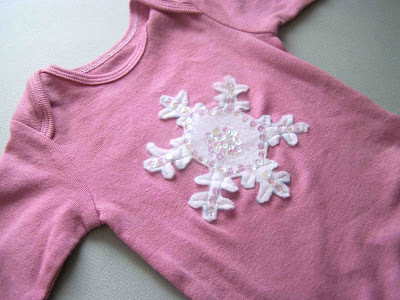 I used fusible adhesive to attach the center of the snowflake to the shirt. Next I machine stitched the branches of the snowflake so that they were tacked down in place. You could stop there if you were making a shirt for the little man in your life, but I wanted to really dress it up. I picked up a small package of iridescent sequins at the craft store, they were less than one dollar. I then sewed them in place with transparent thread. If you've never sewn on sequins don't be intimidated. It takes a bit of time, but is quite simple. I followed the instructions from this video. This particular top is going to make it's way to my nephew. I love how it turned out. It could easily be dressed up with sequins or beads, but I like it clean and simple. 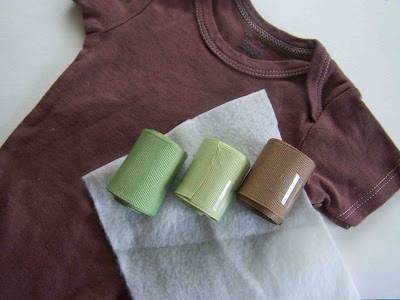 To make this top you will need ribbon, a scrap piece of fabric, heat and bond, and a sewing machine. I wanted to work with multiple shades of green so I used two similar colors, and had a bit of brown ribbon on hand as well. The ribbon that I used was 1 1/2" wide. 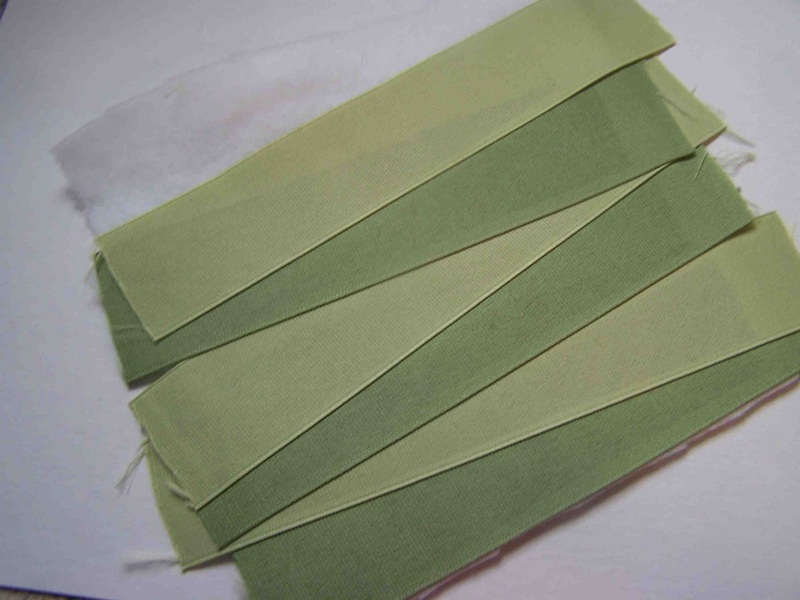 I cut 6 strips of ribbon (three of each shade) that were six inches long each. I then applied a strip of fusible adhesive to the back of each ribbon. (I did not extend my adhesive to the edges, but you certainly could). Next I adhered the strips of ribbon to my scrap piece of fabric, starting at the bottom and offsetting the strips, and alternating shades, as I went up. Next adhere a piece of fusible adhesive to the back side of your scrap piece of fabric. 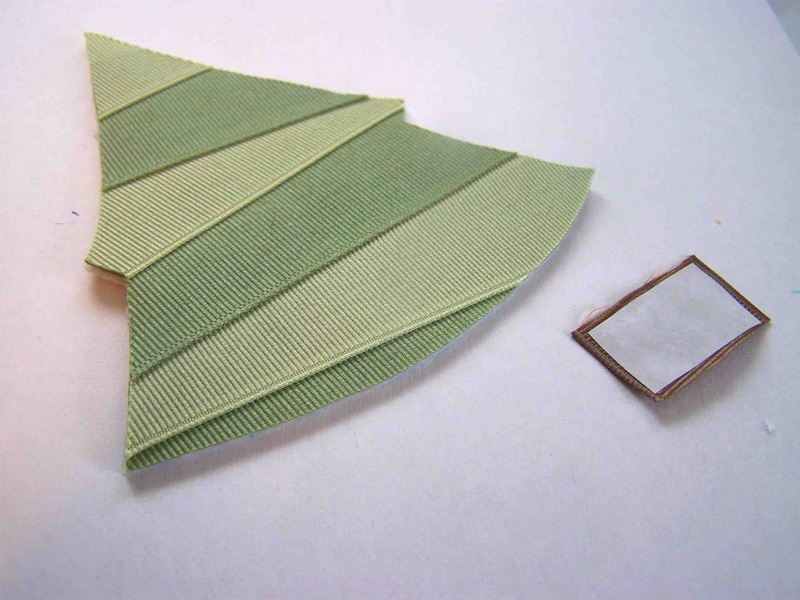 Once you have set it in place, you can sketch out, or transfer your image, onto the paper backing of the adhesive. You will also want to cut a small piece of brown ribbon for the trunk of your tree. My trunk is the width of the ribbon and about one inch long. I rounded the edge of the bottom of the trunk. Adhere adhesive to the back of the trunk piece. Cut out your tree. Apply fray check to the edges of your shapes to prevent fraying. Remove the paper backing from the tree trunk and set it in place with your iron. Stitch the tree trunk in place. Next position and adhere your pine tree in place. Stitch around the perimeter of your pine tree. If you have used fray check on your ribbon shapes you shouldn't have to worry about much fraying. If you didn't use fray check I would suggest using a satin stitch (close zig zag stitch) to encase any raw edges and prevent fraying. That's it. Your festive and simple holiday bodysuits are complete. Your littlest ones are now ready to sport their seasonal fashions. LOVE these!! What a fun way to dress up the little ones...I'll be featuring! Thanks for sharing! SO cute! I love your ideas! You can also use a lighter to melt the edges of the ribbon, if you don't have fray check. As long as you're careful it works great. I love how you did the tree. It looks great! Awesome Gift Idea to. Adorable! I love the Christmas tree! So cute! I adore that ribbon Christmas tree. I love them. The idea to use ribbon for the Christmas tree is so neat! Found you over at Ucreate. These are darling! so cute! 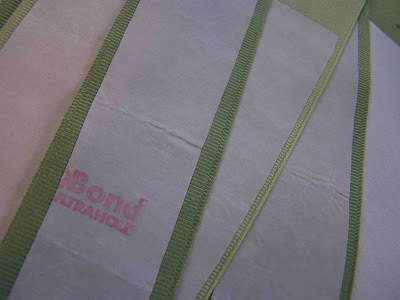 we just did a similar posting piecing fabric on heat n bond. very cool! I featured you today over at Today's Top 20! You did an awesome job!!! 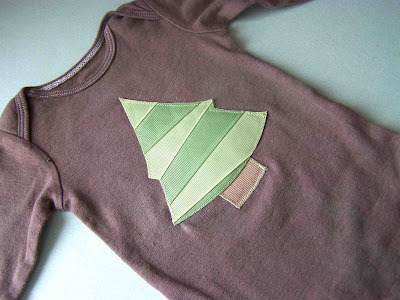 Very cute - wish I had a girl or a niece to make these for! Those are adorable - especially the sequined snow flake. But the way you make the tree is so neat, genious ! Love the tree onsie! Super cute. We will be featuring you on our blog ziggycrafts.blogspot.com Thanks for sharing! What a great tute! Thank you! That's absolutely adorable. We don't celebrate Christmas, but I can certainly appreciate a super cute tree. Maybe itty bitty buttons as ornaments?? SO cute! I want to make one..thanks for the tutorial... Thanks for linking up to Quiltstory! So cute! I love making embellished onesies! I love the tree! What a great concept! These are adorable! Where do you find the adorable plain onesies to start with?